I thought that was because of Verstappens crash but you didn't pick him in the first place. Stop giving away my secrets! Right I'm out to yet another birthday meal, I did manage to push it back 30 mins for the race. 118 had I stuck with my original calls. 128 I think. Verstappen, Alonso and Perez cost me. I probably should have expected Verstappen to crash at some point! The start of the race saw pole man Riccardo lead away from fellow front row starter Vettel, followed by Hamilton, Raikkonen and Bottas. 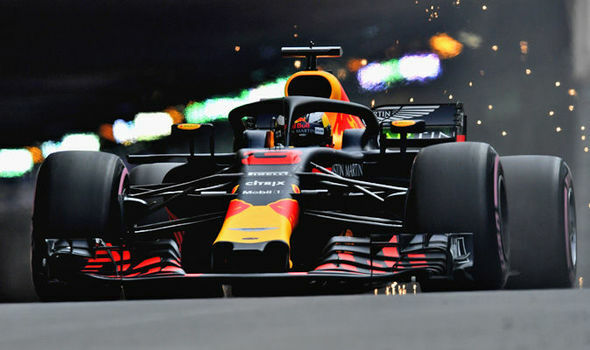 With passing close to impossible in Monaco Hamilton pitted first for the ultra soft tyres hoping for an undercut however as the other drivers also pitted the positions remained the same the only difference being Bottas stopping for the super soft tyres. This seemed to be the right choice for Bottas as he looked to be much the quicker on the super soft tyres however again the problem for Bottas was in passing the car in front, Raikkonen. Meanwhile at the front Ricciardo's car lost power, a loss of electrical power which allowed Vettel to close right up but then again getting past was just too difficult. Thus the positions at the front remained the same with Ricciardo winning from Vettel, with Hamilton third, the point of interest during the race was the progress of Verstappen who started in last place after crashing in FP3 which caused him to miss qualifying, he recovered to finish in 9th place. In third place with 163 points and receiving the "Steadfast Hamilton Trophy"
In second place with 164 points and receiving the "Fighting Vettel Trophy"
In first place with 171 points and receiving the "Redemption Ricciardo Trophy"
Last edited by pokerman on Sun May 27, 2018 8:21 pm, edited 1 time in total. You missed off 15 points for Gasly. That makes up for Barcelona were your original picks would have put you on the podium rather than last place. Oh yeah, forgot he was in the top 10! That's not a bad turnaround though, I'll take it. edit.........I wish they'd make up their minds about Ricciardo's penalties! Last edited by Laz_T800 on Fri Jun 08, 2018 9:21 am, edited 1 time in total. Last edited by Remmirath on Fri Jun 08, 2018 1:56 am, edited 2 times in total. Edited after reading Ricciardo should hopefully now not have a penalty! Last edited by SteveW on Fri Jun 08, 2018 8:15 am, edited 1 time in total. Last edited by TheDamus on Fri Jun 08, 2018 2:15 am, edited 1 time in total. Last edited by Covalent on Fri Jun 08, 2018 6:09 am, edited 1 time in total.